President Donald Trump and House Republicans have championed massive tax cuts for the wealthy and corporations.1 They will likely try to enact these giveaways into law as part of what they call tax reform, as well as through other measures such as repeal of the Affordable Care Act and infrastructure legislation. While tax policy offers many complicated questions, one thing should be clear: The wealthiest Americans and big corporations do not need any more tax cuts. 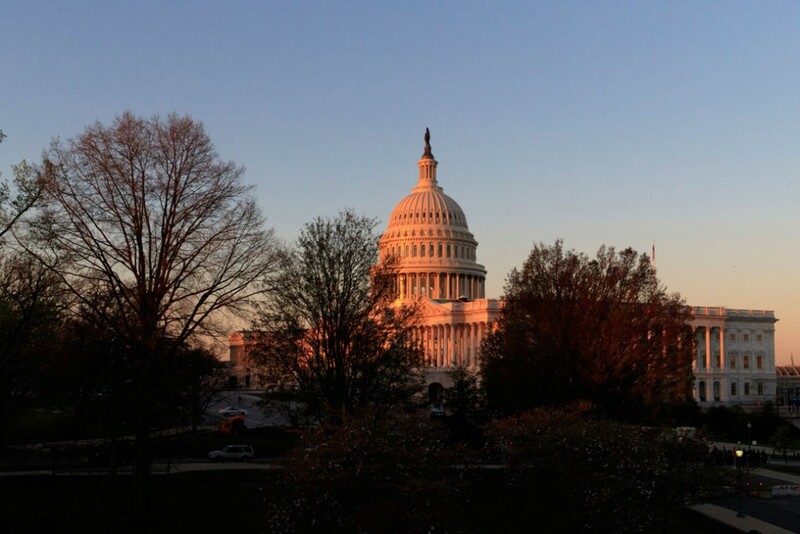 Anyone can clearly see whether proposed legislation would cut taxes for the wealthy or corporations, thanks to high-quality, nonpartisan analysis from the independent Tax Policy Center and the legislative branch’s Joint Committee on Taxation. Trickle-down tax cuts have repeatedly failed to produce broad-based economic growth. A significant majority of Americans not only oppose such tax cuts but would support higher taxes on the wealthy and big corporations. Republicans and Democrats should be able to negotiate bipartisan reforms that make the tax code fairer for everyone. Corporations and the wealthy should pay their fair share, and there should be no place in tax reform negotiations for another round of tax cuts for those at the top. If any legislation cuts taxes for corporations or the wealthiest Americans by even $1, lawmakers should vote no. Some broad-based tax cuts also benefit the wealthiest Americans, which means that these proposals would need to be adjusted to pass the test of not providing tax cuts for the wealthy. Increasing the standard deduction, for example, would reduce taxes for low- and middle-income households, but this would also reduce taxes for wealthy households. In order to prevent a needless tax giveaway for the wealthy, a bill that increases the standard deduction would need to be limited to those households in lower tax brackets or include a revenue-raising measure to offset the benefit to the top 1 percent. In the past, Congress has traded tax cuts for the wealthy and corporations in exchange for continuing important tax benefits for working families.12 But this has gone far enough. Further tax cuts for the wealthy and corporations do not belong in measures to improve the tax code for working families, because these tax cuts will undermine vital programs for working families. After the most recent such tax deal in 2015, congressional Republican leaders used the subsequent increase in deficit projections to attack what then-House Budget Committee Chairman Tom Price (R-GA) termed “insolvent Medicare and Social Security programs.”13 Price is now President Trump’s Secretary of Health and Human Services.14 Cutting taxes further will make it easier for majority leaders in Congress and the Trump administration to claim that massive cuts to programs such as Social Security, Medicare, and Medicaid are necessary to avert a fiscal crisis. 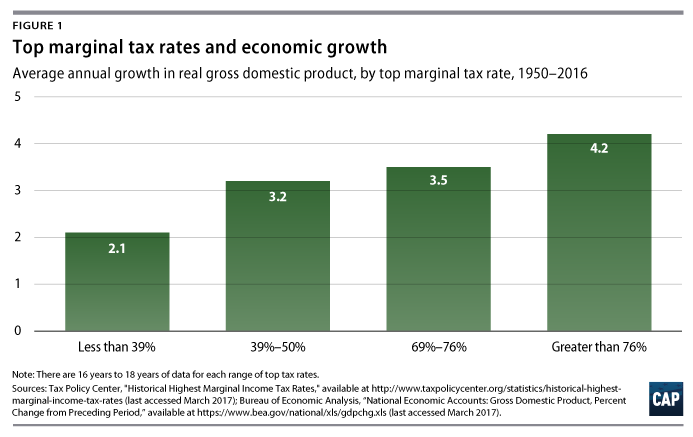 Since 1950, economic growth in the United States has tended to be higher during periods with higher top tax rates.21 This does not mean that high tax rates for the wealthy cause economic growth, as correlation does not prove causation. But if cutting the top tax rate paid by the wealthiest Americans is supposed to be the key ingredient for growing the economy, it is strange that this effect has been invisible for more than 60 years. Although cutting taxes for the wealthy has failed to grow the economy, it has succeeded at helping the rich get richer. A cross-country analysis by economists Thomas Piketty, Emmanuel Saez, and Stefanie Stantcheva found that countries that made larger reductions to their top tax rate were more likely to have larger increases in the share of income flowing to the top 1 percent.22 The same study found no relationship between reductions in the top tax rate and overall economic growth. The sense that some wealthy people and corporations are not paying their fair share of taxes is a major concern for many Democratic, Republican, and Independent voters, according to a 2015 poll by Pew Research Center.29 This concern is particularly striking for Republican voters, since the tax plans proposed by President Trump and House Republican leaders include large tax cuts for the wealthiest Americans.30 According to a March 2016 poll by political scientists Alan Abramowitz, Ronald Rapoport, and Walter Stone, 56 percent of Republican primary voters favored raising taxes on households making more than $250,000 per year.31 The same poll found that President Trump performed especially well among voters who favored higher taxes on the wealthy. Tax cuts for the wealthy and corporations have repeatedly failed to grow the economy, and the American people strongly oppose this trickle-down agenda. 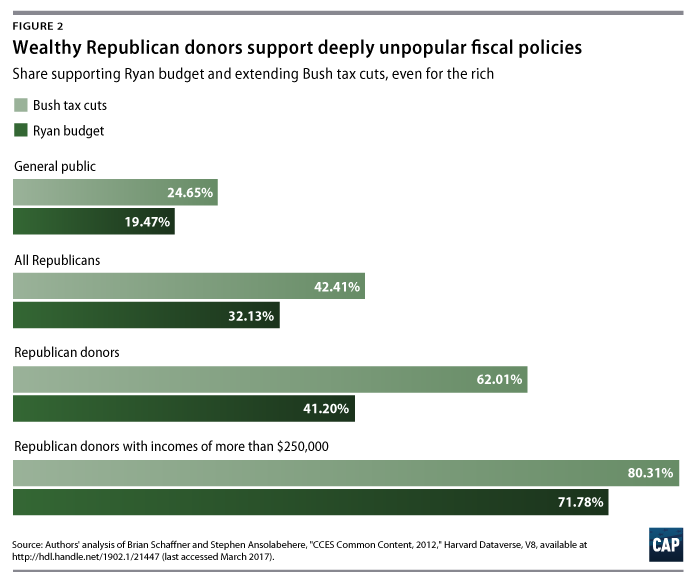 After an election in which voters rejected elites of both political parties, members of Congress should take a stand against any policy that further enriches wealthy and corporate interests. Lawmakers should make clear that tax cuts for the wealthy and corporations are off the table—and get to work on the negotiations and compromise that will be necessary to make the tax code work better for average Americans.